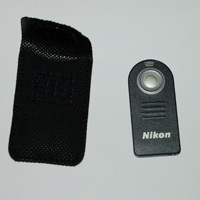 This strange little device is the remote trigger for my Nikon D50 (the black thing on the left is a slip cover for it). What this does, is lets you take a picture when you aren't actually at the camera. This is very useful when using a tripod with a delicate set up, but is also useful for taking photos that you actually want to be in yourself - such as group photos. There are two settings on the camera for it. Firstly, you can set the camera up to take a photo immediately when you press the button. Secondly, you can set the camera up to take a photo two seconds after you press the button. I found this to be most useful! It takes one CR2025 (button cell) battery, and it does come with one. You have to pull the plastic insulator out first. It's a little tricky to take the battery out, you need to push a lever down with your thumbnail whilst pulling the tray out. It's pretty easy to get the hang of though. This is an official Nikon product, and cost me AU$39.95 at the end of October 2005. This does seem a little pricey for such a basic accessory, but I found it to be worth every cent. Copyright © 1995 - 2018 by Matt De Bernardo. This page last updated 2016-10-08.